Here is my entry into the 2007 Federal Duck Stamp Contest which happens to be for the 75th anniversary stamp. Because of the anniversary I went for a nostalgic, old fashioned looking image that hints at the earlier, original federal duck stamps. The painting is somewhat of a risk because I have never seen an entry that looks quite like this. That means that the judges will either really like it or vote it out immediately. This year will be tougher competition than normal so hopefully the difference from the other entries will help it to stand out. This past weekend my family and I along with extended family went on a camping trip to Suttle Lake, which is located near Central Oregon near Santiam Pass. On this trip, I was able to gather a bunch of reference material for some future paintings. Two species of note were Common Mergansers (above) and Barn Swallows. With the swallows, I was able to get up close and get some great shots of four fledging birds on their nest (pictured to the right). T heir mother was continually feeding them captured insects. 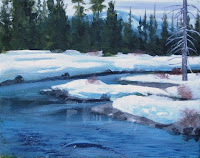 Also, I was able to complete some more plein air paintings which will soon be added to my website. The first one that is going on the site is of Link Creek - the inlet to the lake.